A to B to Sea: Getting ready to go! Once the boat went back in the water, we busied ourselves making it shipshape. One lesson I learned (and which allows Bryce to say "I told you so") was that it wasn't the best idea to have cleaned the boat before work was done on it! I spent a large amount of time cleaning up grease and other messes from random places and scrubbing the deck to remove black work boot footprints, which still haven't come off - new rule: Only dedicated boat shoes are allowed to be worn on-board... full stop no exceptions! Bryce took one for the team and repaired the toilet. Up until that point, needing the toilet involved a trip to the shopping centre up the road so this was a essential task if we had any hope of leaving shore. We moved most of our things on board, found places to stow them and finished up other jobs that needed to be done while we were still attached to land. 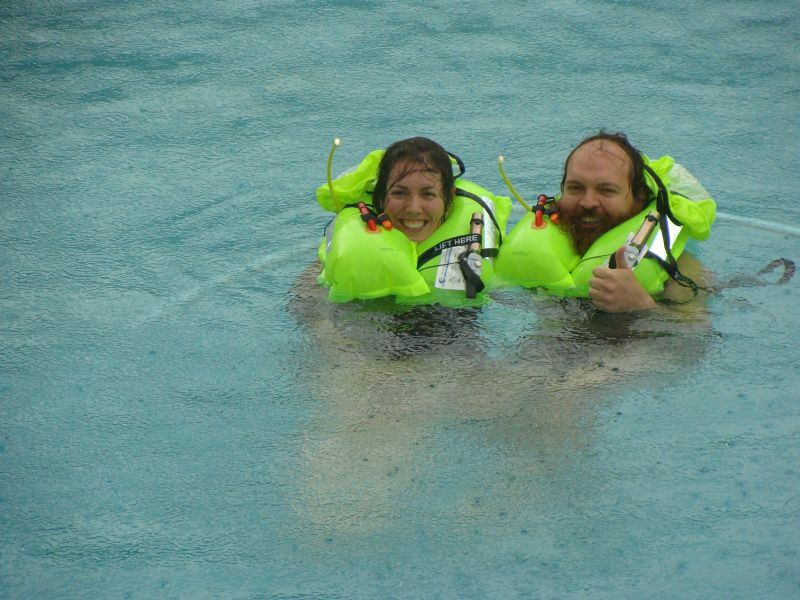 We needed a rainy afternoon to test our brand new automatic lifejackets. We stood in the rain in them to make sure they wouldn't inflate with that amount of water and then jumped in the pool to make sure they would inflate! We also had to wait for a non-rainy afternoon and spent it inspecting the sails. We have seven sails on board. The mainsail and jib are permanently rigged on the boom and jib furler, respectively, and are the two sails we will use most frequently. In addition, we have a trysail which is our stormsail, a staysail which sits between the main and jib and a spinnaker which we will use for sailing downwind in light breezes. We also have a spare main and jib, just in case. For my birthday at the end of May, we went down to Adelaide to spend some time with my family and have a little break before we took off. We had a great time staying with my Grandparents, catching up with other family and friends, went wine tasting, went boating (speed boating for a change of pace), ate lots of wonderful food and drank much delicious wine. It was a well-needed relaxing break! The intention had been for us to move on board as soon as we returned from Adelaide however as luck would have it, both Bryce and I got sick consecutively, thus delaying our departure even more. 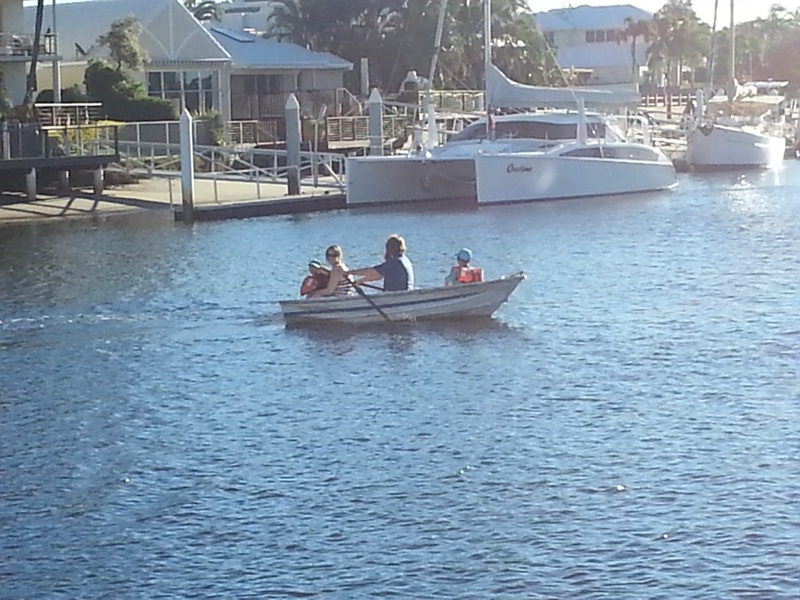 This past Saturday, Bryce's brother and his family came up to the boat again. 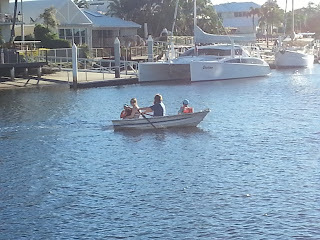 It was much less stressful to have kids on board while the boat was in the water compared to last time. Jack was very inquisitive and enjoyed opening every cupboard and floorboard. He was quite proud that he was able to empty the bilge by using the manual pump. We strapped both Jack and Lily into lifejackets and left Dean and Mint in charge of Aquabat while the four of us took the dinghy out for it's first trip. On Sunday we came up to the boat with the last of our clothes and the intention of making a permanent move! Bryce's Uncle Tim came up with us and helped us immensely by doing all sorts of handy odd jobs around the boat! Bryce and Tim had been working on finishing up a ingenious modification to the siphon break for the engine cooling water which was finished just outside the tide window we needed to safely move the boat. Aquabat draws 1.9m (~6ft) and so we need a high tide to safely maneuver though the canals without running aground. We had a lucky break and were able to stay with the boat that night and avoid driving home. The following afternoon we finally cast off our docklines and headed off. We weren't going far but it was still a big step! There is an anchorage called the "duck pond" just around the corner from where we were. We made it there and successfully set our new anchor and settled in for our first night! The great adventure has finally begun!